A writer ‘s life comes with so many challenges, it’s a wonder anyone makes it to becoming a published author. But I think most writers are well suited for the solitary life of putting words together to create something never heard of before. These past two weeks have been hard. There’s no denying the struggle which comes from having multiple writing deadlines but no way to meet them. My computer died two weekends ago and I’ve spent the past fourteen days fighting with different customer service departments. No one wanted to take responsibility for the fact I bought a brand new computer with two different warranties on it and now it crashed because of a defective hard drive. NANOWRIMO…I’ve been writing in a notebook but it’s not the same and I have fallen horribly behind with my word count on LUNADAR: Candra’s Revenge. I probably won’t hit the 50,000 winning words, but any I write this month is more than I started the month with, so I’m okay with that. Blog posts…I had to be REALLY creative to get last week’s posts done and lined up to drop every day when I had no access to my computer. Today I’ve spent most of the day working on all of next week’s posts so I can roll into my Thanksgiving weekend without the stress of creating those posts. ***DON’T FORGET! It’s week nine of THE TWELVE WEEKS OF LUNADAR giveaway and this week you get a chance to accessorize your desk or nightstand with the cute doggie bookstand shown above! Just click on the pile of presents to the right of this post and choose how you would like to enter the FREE giveaway. Winners will be announced every Monday in my INDIE AUTHOR’S JOURNEY post! All my friends in Canada celebrated their Thanksgiving last month. But if you live in the United States, there’s pretty much only one event celebrated in the month of November and that’s Thanksgiving. For the patriots among us, there is always Veteran’s Day, but some may think what is more patriotic than honoring the bird Benjamin Franklin thought should be our national symbol? No, I plan on roasting that fabulous fowl until he is a golden brown and smelling of all those fall holidays spent crowded around my childhood dinner table, passing the potatoes and gravy…and hoping I found the turkey tail before my daddy did. I’m from Cajun country and we didn’t believe in throwing out what others might turn their noses up at. Poor people need to eat like everyone else and in our humble home, EVERY part of that bird was eaten except for the gobble! This month will be a busy one for me. I juggle three careers at the same time and most days I feel like I’m a circus performer. My martial arts school is in the middle of our holiday sale while winding down to the last belt testing of the year and a much needed vacation for me. Come on December 22nd! I’m also participating in NANOWRIMO (National Novel Writing Month) where I am challenged to write the first draft of a 50,000 word novel within 30 days. I’m sorry to report I’ve only written about 5,000 words so far which puts me way behind where I should be. This weekend I’m hoping to hopefully double that number, thanks to chapter plotting I did prior to the start of this challenge. Cross your fingers and wish me luck as I try to tie up all the loose ends of Ariana, Kaspar, and Candra’s adventures in book three, LUNADAR: Candra’s Revenge! 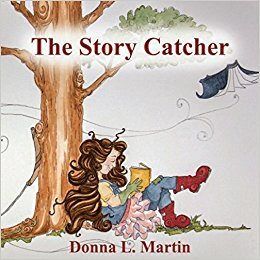 While dealing with the school and the next book in my LUNADAR trilogy, I also can’t forget my publishing company, STORY CATCHER PUBLISHING. I’ve done a few book signings, running the TWELVE WEEKS OF LUNADAR freebies giveaway, and put the ebook copy of LUNADAR: Homeward Bound on sale for $1.99 through most online retailers, including Amazon, Barnes & Noble, Books A Million, Nook, etc. I’m also working on the book covers of both Candra’s Revenge, and my new historical fiction chapter book series. I plan to start looking for illustrators to work on these projects with me after the holidays, so if you know of any good illustrators out there, send them my way! My life always seems to be full and my plate gets heavy some days, but I am excited about this indie journey I have created for myself and wouldn’t have things any other way. ***DON’T FORGET! It’s week eight of THE TWELVE WEEKS OF LUNADAR giveaway and this week you get a chance to accessorize you car with a Yankee Candle fragrance locket shown above! Just click on the pile of presents to the right of this post and choose how you would like to enter the FREE giveaway. Winners will be announced every Monday in my INDIE AUTHOR’S JOURNEY post! ***Also, the ebook version of LUNADAR: Homeward Bound is on sale through the holidays! You can grab your copy for only $1.99 through Amazon, Barnes & Nobles, Nook, Books A Million or dozens of other online retailers! Some writers think that once their book is published, the publishing journey is over. They sit back on their laurels and wait for royalties to roll in. I’m not that type of author. As a hybrid author, I have the opportunity to see possible royalties from any book published through a traditional publisher. But, as an indie author and actual owner of my own publishing house, I will only see money from my books based on my own efforts to market them. This also includes building a “brand” based on both an expanded collection of published works, and an ever-widening network of people who support my goals as much as I support theirs. Last month I participated in INKTOBER, a drawing challenge where I sketched 30 drawings in 30 days based on the word prompt of the day. It was the second year I had participated and helped introduce more people to what I was all about. I started an Instagram account and now have another 226 followers added to my fan base. This month I am participating in NANOWRIMO (National Novel Writing Month) where I have begun what will become book three in my LUNADAR trilogy. I’m juggling working full time during the day while trying to complete writing a 50,000-word novel at night. Add to that, my lining up book signings, hosting giveaways, researching book contests and effective inexpensive book marketing…all the while preparing to also finalize book one in my historical fiction chapter book series so I can potentially roll THAT series out by next summer through my company, Story Catcher Publishing. I’m also getting ready to promote my next traditionally published book, MY JOURNEY MY JOURNAL coming out later this month, all the while continuing to provide my followers with five blog posts every week for at least the next year. And so the juggling of precious time continues. How do YOU handle all your daily commitments and obligations filling YOUR plate? Share your tips in the comments below. You never know when you just might help a poor gal out! ***DON’T FORGET! It’s week seven of THE TWELVE WEEKS OF LUNADAR giveaway and this week you get a chance to win this ocean themed jewelry set shown above! Just click on the pile of presents to the right of this post and choose how you would like to enter the FREE giveaway. Winners will be announced every Monday in my INDIE AUTHOR’S JOURNEY post! I’m a visual writer and love adding visuals to my book display when I go on author visits. I had a replica of the Cup of Notari holding skull pencils to give away, a small resin treasure chest with pirate coins, a limited edition whale tale statue, a replica of King Midar’s lost journal, as well as some STORY CATCHER PUBLISHING business cards, and some promotional postcards for my young adult fantasy novel, LUNADAR: Homeward Bound. I also got to hang out with a couple of my critique partners. Here is Rick Starkey, fabulous author of BLUES BONES. His middle-grade novel is about voodoo and blues music. He jammed on that cool guitar when he wasn’t meeting people, and even showed me a magic trick which came pretty easy to him since he owns a magic shop in Gatlinburg. This is the sparkly Debbie Dadey, another of my critique partners. I want to be like her when I grow up. IF I ever grow up. She writes lovely chapter books for children and has sold MILLIONS of copies of her BAILEY SCHOOL KIDS series and now her MERMAID TALES series. She looked regal in her lovely mermaid costume. Here we are…Rick, Debbie, and myself…all dressed up and having a blast as a character from our books. Here are some of the other authors who attended the book signing event. I met all of them earlier this year during the Rose Glen Literary Festival but now I was “one of them”. Here I am chatting with Fayla Ott. She has written some Christian romance novels before but her latest book, AFFLICTED, is a historical fiction about the Salem Witch Trials. We discovered we had much in common…both ran a martial arts school, both were hybrid authors, both came from Louisiana. It was fun sharing our publishing journeys with each other. But by the end of the day, I could look around and see we are ALL winners because we shared a common goal…sharing our stories and a love of books with others. ***DON’T FORGET! It’s week six of THE TWELVE WEEKS OF LUNADAR giveaway and this week you get a chance to win another audio book shown above! Just click on the pile of presents to the right of this post and choose how you would like to enter the FREE giveaway. Winners will be announced every Monday in my INDIE AUTHOR’S JOURNEY post, so enter the FREE giveaway and check next Monday to see if you’ve won!